A Pool Party – for the dogs? Yep, you read that right. Once a year, Metro Parks offers dog lovers a chance to bring their pooches to a pool for a wet and fun time. Now I am not a fan of the smell of wet pooch, but the fun many breeds have in the water is about the same amount of fun my 2yr old has in the water, pure bliss and glee. So, why not? Go out and let your pooch splash free. Please bring well-socialized dogs only to this event. Maximum pool depth: 4 feet, 3 inches. People are not allowed in the pool during the party, but will be able to watch from the deck. Stewart Heights Pool closes for the summer on September 3. Pool chemicals will be turned off a few days prior to the Pool Party so that irritation is minimized for the dogs. Scoop bags will be provided. Dogs must be on leashes when they are out of the water. This looks like a great opportunity to go and have some water fun! So, go splash and have an experience with the kiddos before school starts! Mark your calendars for the 10th annual Kids Day at Steel Lake Park, coming up Aug. 1. Families with kids between the ages of two and twelve years old are invited to the free day of fun from 2 p.m. to 8 p.m. at Steel Lake Park. Activities include $3 slide and train rides, games, arts and crafts, live music from Batch 5 and ShowBiz Kids, performances by magician Rick Anderson and the Federal Way Summer Craze Day Campers. Concessions are also available for purchase. via Free fun for little ones at Kids Day at Steel Lake Park | Events | Federal Way News. This looks like so much fun, especially the water! If you are nervous about keeping your kids near the water, check out this program from an earlier post. You can borrow, on a short term basis and for free, life vests for the kiddos. Im not sure how many people know of this wonderful service, but I need to blow the whistle. This is a great organization that is offering invaluable services to our community and it is WAY under-funded and under-utilized. We need to change that! Mary Bridge Childrens Hospital in Tacoma has some really great safety programs for kids. I know if I could wrap my kids in bubble wrap for the rest of their lives to ensure they don’t get hurt I would. But I also know they would be scarred for life upon entering Jr. High. So, we as parents do the next best thing: we baby proof, provide bicycle helmets, get car seats fitted and generally do what we can to provide a safe environment for our kids to grow up in. Safe Kids Worldwide is the first national non-profit organization dedicated to the prevention of accidental childhood injuries to children under 14 years of age. Mary Bridge Children’s Hospital and Health Center is the proud lead agency for local Safe Kids coalitions in Pierce and King County-South. Members of local Safe Kids coalitions represent a wide variety of community organizations such as fire departments, law enforcement departments, education programs and schools, health care organizations, local health departments, human service organizations and other community members. My family has used both the car seat checks and the loaner life jackets. The life jackets are not trendy, nor cute and they have the MultiCare/Mary Bridget information on them, but hey they work! This weekend we will be doing a lot of swimming and you know what? 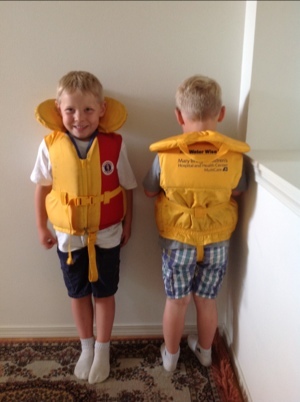 Rather than buy life vests for the short time we will actually wear them, Mary Bridge has loaned them to us for free! My kids are safer because of this program and for that, I thank you from the bottom of this moms heart! If you are looking for a car seat check closer to you: Check here for a list of events! I love watching the milk carton derby. Its great to see how far each team will actually get. While I usually watch on the television, I can only imagine how much fun this would be in person.